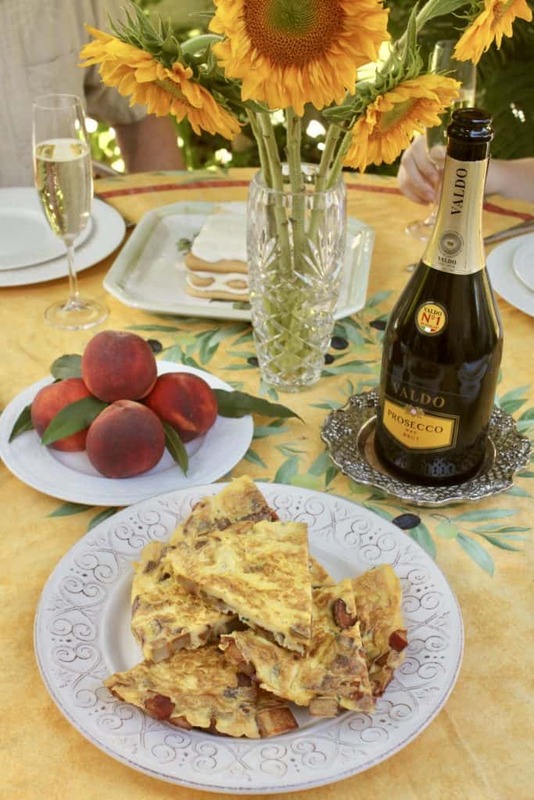 This lovely Italian brunch menu with lots of recipes to make a fabulous brunch for family and friends including a step by step frittata recipe. 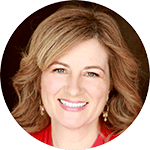 Years ago, when I first started Christina’s Cucina, I shared a step by step frittata recipe. I think maybe 7 people saw it, plus a dog. 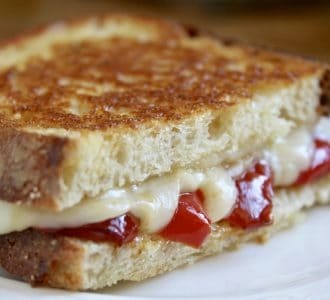 It’s a shame that all of my “old” recipes are essentially buried in my site, as there are some really good ones there. However, there is a plus side (for me) as I need to update a lot of the photos and am rather glad no one is seeing them at the moment. 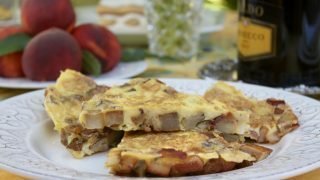 I just reshot some photos of my bacon and potato frittata, as you can see, but there’s no way that I know of to resend the old post to my lovely subscribers. 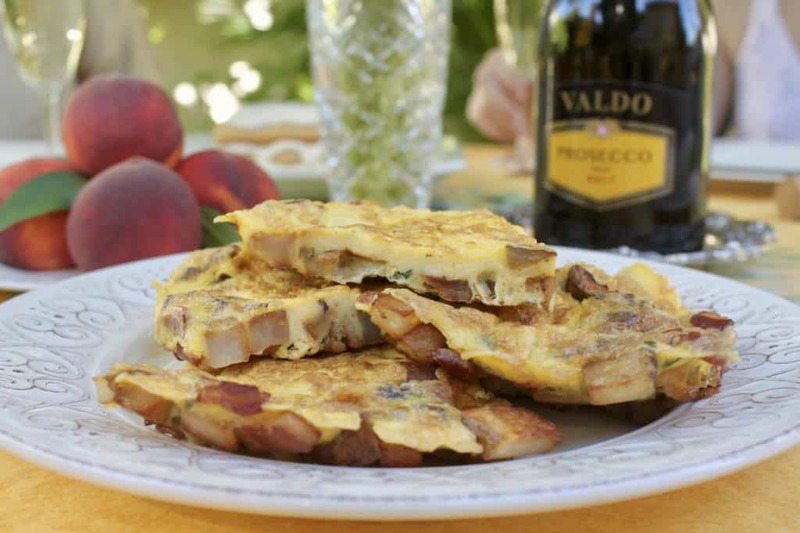 So this is what I’m doing: I’m writing a new post to say, “Hey, check out my bacon and potato frittata recipe!” In addition to my step by step frittata recipe, I want to introduce you to Valdo Prosecco and give you some wonderful menu ideas for brunch with an Italian theme! 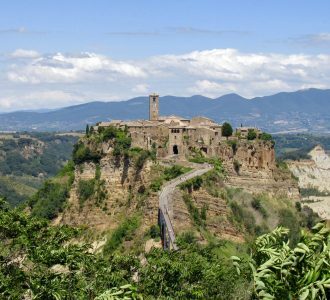 I have another reason for this post: how could I resist entering a contest to win a trip to Italy when brunch and Prosecco are involved?! I ordered a bottle of Valdo Prosecco and the wonderful liquorman (hey, he’s like a milkman, but delivers liquor ?) dropped it off to me the next day. 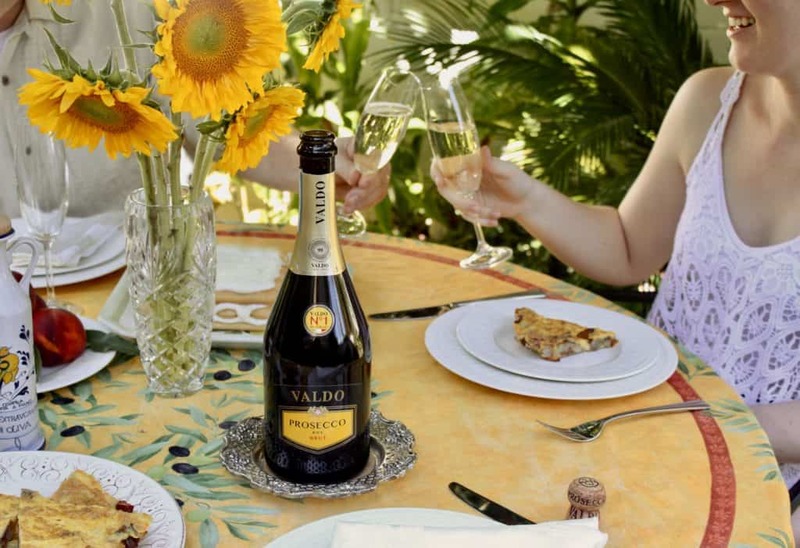 In order to be in the running to win a trip to Italy, I am to take a photo of brunch with Valdo Prosecco! Not a problem as we often have Prosecco at my house. 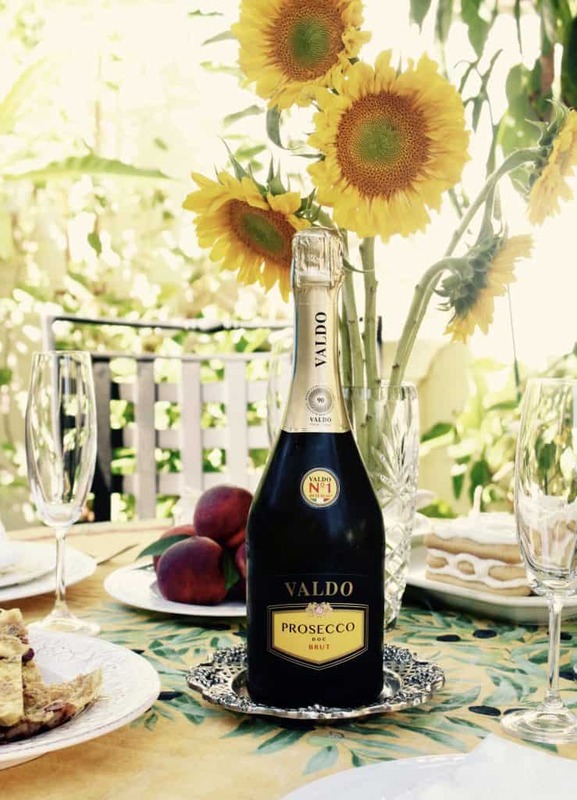 This was my first bottle of Valdo Prosecco, however, and it was lovely! 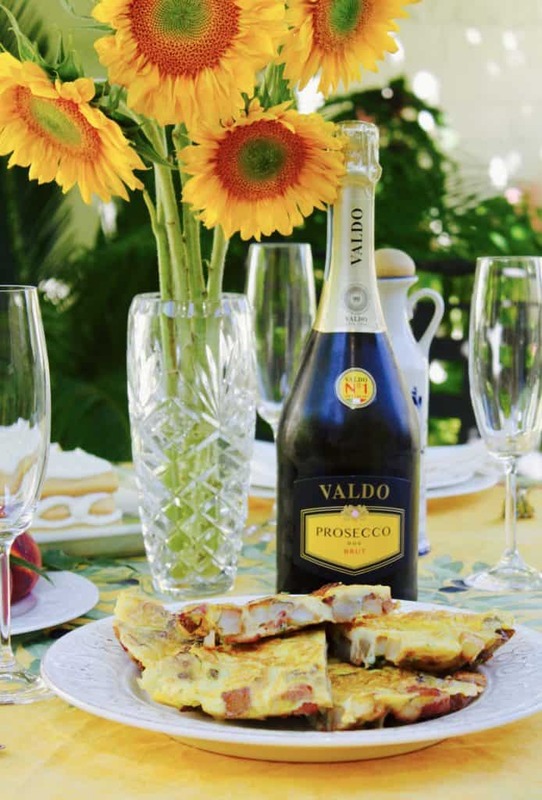 Valdo is dry and crisp and absolutely perfect when paired with an Italian themed brunch including dishes like frittata, fruit and limoncello tiramisù. 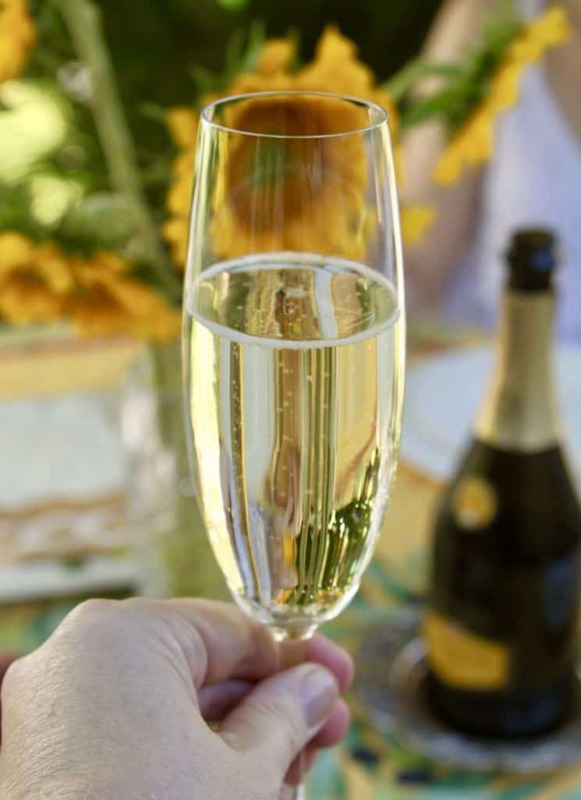 I adore contests that include drinking Prosecco and eating delicious food; don’t you? Here’s the favor I need to ask of you: could you please vote for my photo? Edited 8/22/17 VOTING IS NOW OVER, and I WON!! THANK YOU FOR YOUR VOTES! 🍾 I made it for the top 25 voted entries, and the judges to chose my photo below as the winning submission! 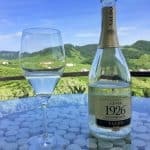 The trip includes a special day trip to Valdobbiadene, where Valdo Prosecco is made! Now, for that step by step frittata recipe that I promised you, click the title below for detailed directions with photos. Printable recipe below. 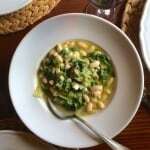 And if you’re looking for recipes for an Italian themed brunch, you’ve come to the right place! Let me know if you have any questions regarding any of the recipes. What is your favorite dish for brunch? 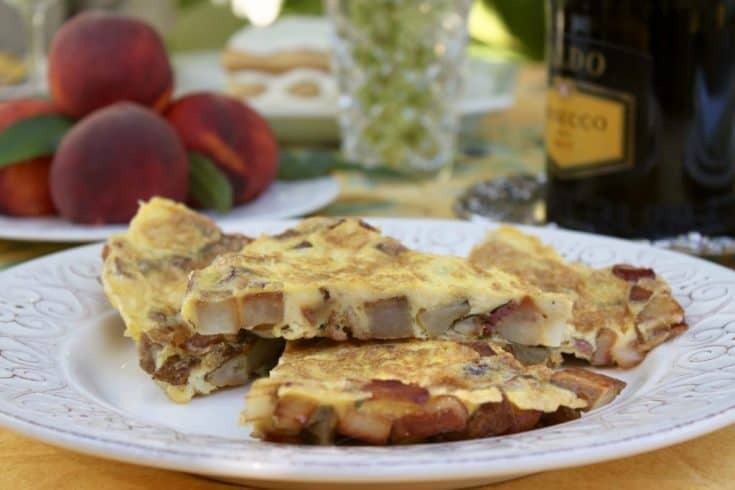 A typical Italian style frittata made with potatoes and bacon. Fry the bacon pieces in a non stick pan until cooked, but not too crispy. Place onto a paper towel lined plate and set aside. Drain the bacon fat from the pan, and add some olive oil. Fry the diced potatoes over medium high heat, until golden brown and thoroughly cooked, turning often. Beat the eggs, Parmesan cheese, parsley, about a tablespoon of water, salt (about 1/4 tsp) and pepper. When the potatoes are ready, sprinkle with a little salt, lower the burner to medium heat, then put the bacon back into the pan, dispersing evenly. Now, add the beaten eggs. With the corner of a spatula, cut into the frittata to allow the liquid egg to go through to the bottom of the pan, tipping the pan at times to also allow it to run to the edges. The goal is to try to cook the egg as much as possible before turning the frittata. When the egg is mostly cooked, if you are a pro, you can flip the frittata in the pan! Or you can do what I do, which is place a large plate over the pan and turn it upside down, carefully, onto the plate, then slide it back into the frying pan. If you don't mind it not looking perfect when finished, you can also cut it into "slices" like a pizza, and turn one piece at a time. 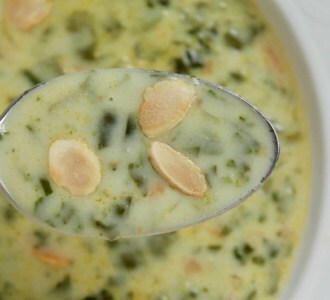 Serve hot, on its own or with a salad, or other side dish. You decide how you like it best, because with frittata, the options are endless! 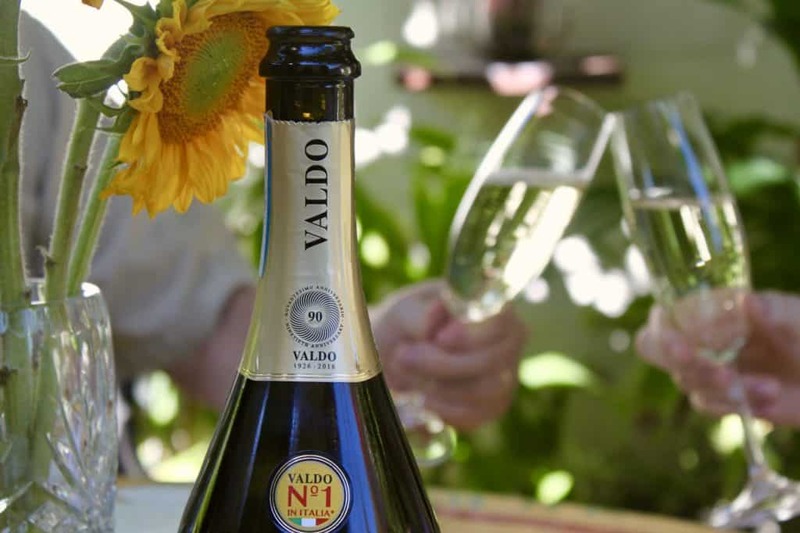 I haven’t tried Valdo Prosecco yet and you can believe it is on my list. Love your brunch and all your menu options too! Yes, it needs to be on your list, Ginny! You’ll love it I’m sure! I absolutely love frittatas and how easy they are to whip up. Pair that with a bottle of Prosecco and that’s a definite winner! I totally agree! Thanks, Lisa. Can’t wait to try this Frittata recipe. Bookmarked this page so I can go back for reference. Thanks for sharing. How gorgeous! What a wonderful way to enjoy the day. 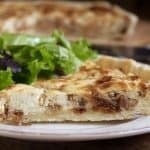 The frittata sounds and looks wonderful. 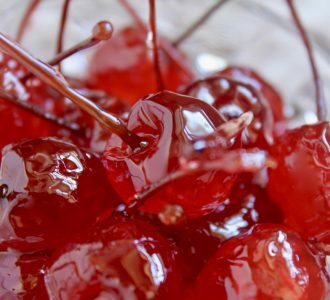 I love the old recipes that need more love – they are some of the best :) Outstanding! What a lovely brunch spread with a great theme! Wait! Why wasn’t I invited!? Haha! Anytime, you’re welcome to come over!! Good luck! I hope you win this fantastic trip! Thank you so much, David! It would be absolutely lovely to visit Venice, but especially to go to the winery! Ok I was vote 70! 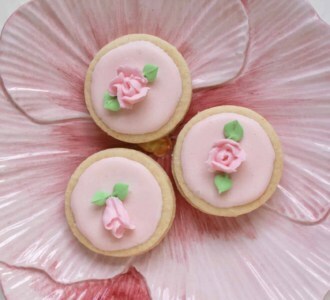 I enjoy you recipes and web page. Yippeee! Thanks so much for your vote and lovely comment, Donna! ? Just voted – best of luck! Voted! And I love the frittata recipe. Can’t wait to try it! Woo hoo! Thank you so much Melinda, and I bet you’re going to love the frittata! Enjoy! 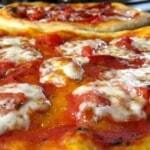 One of my favorite, looks so good I would like a piece right now, with a glass of Valdo Prosecco it sounds perfect! 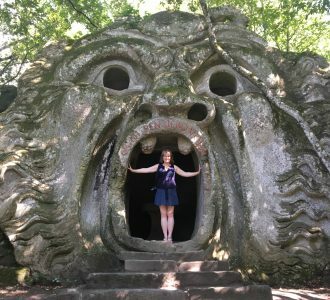 Good luck on winning the trip to Italy.